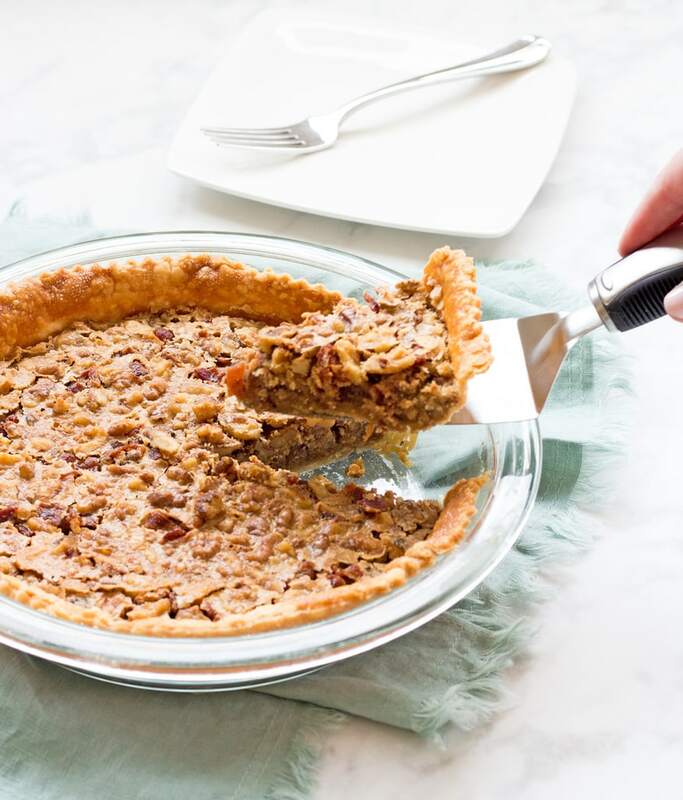 Maple bacon walnut pie is just what your holiday dessert table needs. The savory bacon bits are the perfect counterpart to the sweet, maple syrup-covered walnuts. Cookies get all the hype during December and pies are left behind with Thanksgiving, but if you ask me, pies are still a key player in the dessert realm at Christmastime. This past weekend I made a maple bacon walnut pie and it was just what I needed. No, you did not misread that sentence, this pie has bacon in it—and it works. It creates a savory, salty flavor, which offsets the sweet maple syrup and crunchy walnuts. If you are a fan of pecan pies, then you should definitely try making this one. It has a similar consistency (think gooey and crunchy at the same time), but has a delightful bacon flavor in every bite. 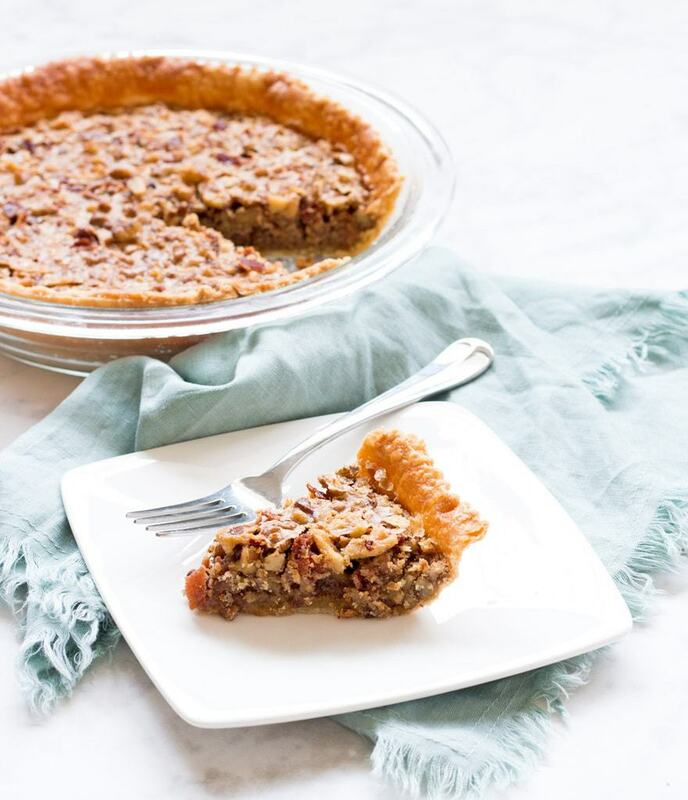 And like pecan pies, this maple bacon walnut pie freezes beautifully—perfect for the busy holiday season. Just let the fresh pie cool completely, then wrap tightly and freeze. You can defrost the pie in the refrigerator, or if you’re in a rush, put it in the oven at 200° F for 20 to 30 minutes. 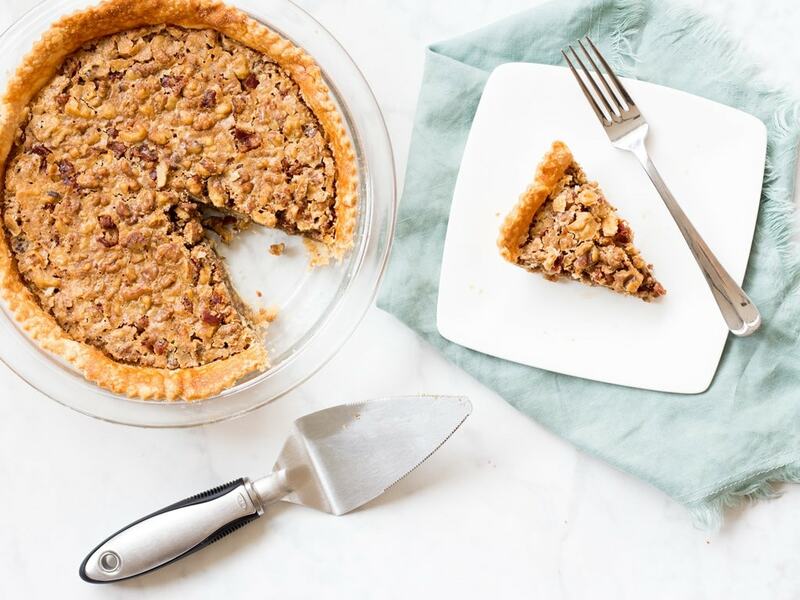 The OXO glass 9″ pie plate I used is made of thermal shock resistant borosilicate glass, which means it can go from freezer to oven without the need to thaw. How perfect is that? I also had a lot of fun using the OXO double pastry wheel on my pie crust. I was able to trim the edges right there on the pie plate, which has a generous rim making it easy to transport from the oven to the table! I also used the pastry brush to apply an egg white wash on the crust (making it nice and shiny). 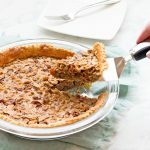 If you signed yourself up for bringing a dessert this holiday season, definitely try making this maple bacon walnut pie. It’s something out of the ordinary, but will still satisfy everyone’s sweet tooth. Preheat oven to 400° F. Place pie crust in a 9-inch pie dish and set aside. In large bowl, beat eggs until slightly foamy. Whisk in browned butter, white sugar, brown sugar, and maple syrup until combined. Stir in flour, milk, and vanilla. Add walnuts and bacon and stir until fully coated. Pour filling into pie crust. Bake 10 minutes, then reduce heat to 325° F and bake until filling no longer jiggles in the center, 40 to 50 minutes more. Cool completely (ideally overnight in the fridge) before slicing and serving. 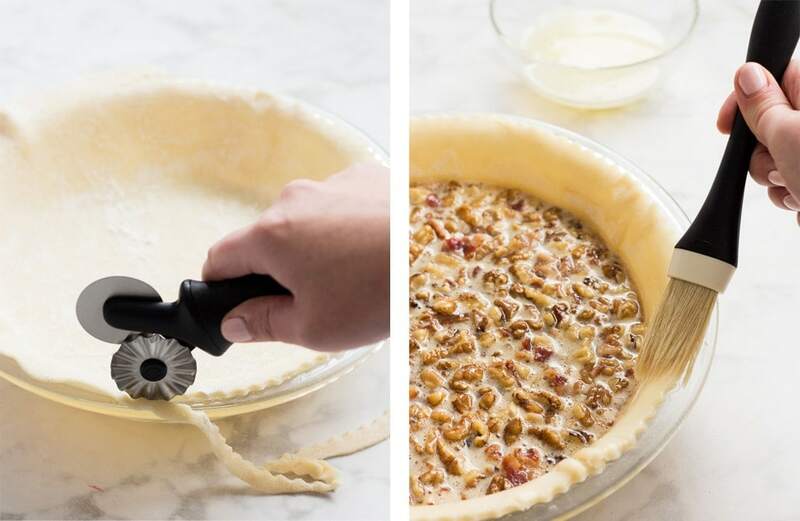 Making this maple bacon walnut pie ahead of time? Let the pie cool completely, then wrap tightly with plastic wrap and freeze. Thaw in the refrigerator, or reheat for 20 to 30 minutes in a 200° F oven, or until warmed through (perfectly safe to do with the OXO glass pie plate). Disclosure: This post is not a paid advertisement. I am not compensated for this recipe or blog post, but did receive at no charge the OXO Glass 9″ Pie Plate, Glass 1.6 Qt Loaf Baking Dish, SteeL Pie Server, Double Pastry Wheel, and 1″ Pastry Brush to assist with this post. My opinions are my own. 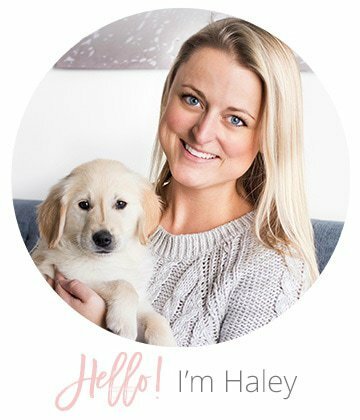 Special thanks to OXO and their Blogger Outreach Program! Made your recipe today and it was delicious! Thank you for sharing.